Easter will arrive in style this year. This adorable plush bunny has hand stitched eggs on his feet and delivers an array of delicious traditional Easter treats and toys for that little loved bunny in your life. 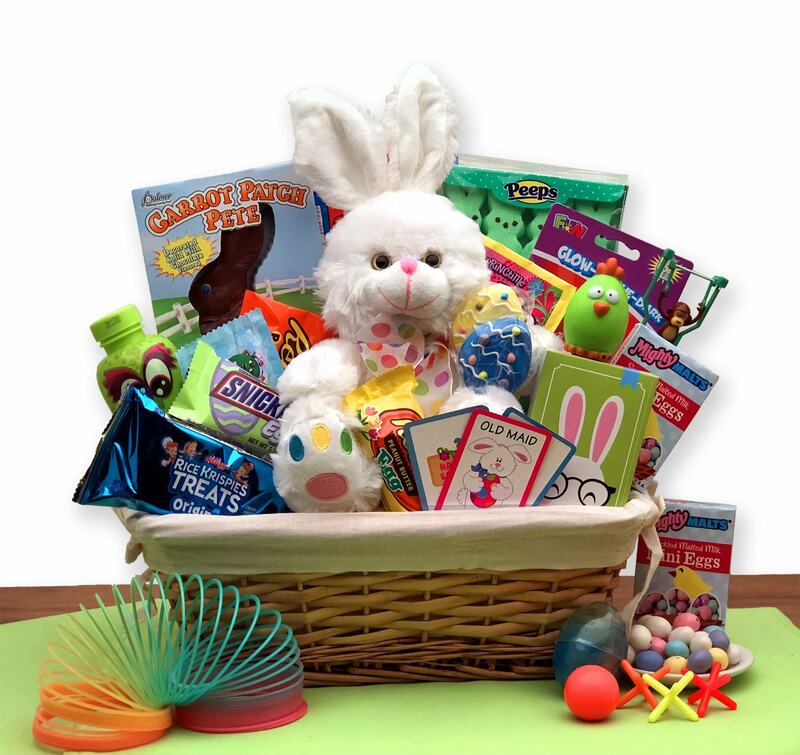 Fabric lined honey stained basket, Plush 12" bunny, Easter kids card game, Easter tails bunny candy, bubbles, relaxable Easter chick, candy filled monkey jumper toy, glowing putty, fruit flavored Fun Dip, 2 frosted Easter pops, Reese's peanut butter egg, Snicker's milk chocolate egg, Rice Krispies treat, Fun size M & M's, Fun Size Reese's Pieces, ball and jacks game, magic spring, Mighty Malts malted eggs. This gift comes wrapped in cellophane and topped with a hand made Easter Bow.